JLA Music - Slash Chords Are Not Brandished By Slashers! Slash Chords Are Not Brandished By Slashers! Slash chords. Aren't they something that serial killers wield? That might be what I'd think if I were a horror film fan. (I'm not.) I'd probably have a mental image of a serial killer running around with a musical instrument slashing people. The thought of Jason slashing people in this way is a ghastly thought, isn't it? But I can assure you - as a non-violent person - that this is not the truth about slash chords. So if slash chords have nothing to do with slashers, why is the word "slash" employed? The answer is frighteningly straighforward. Here's what a slash chord is: Quite simply, it's a chord symbol that uses the slash symbol to separate a chord name from a specific bass note. If that's all you need for a definition, then you can stop reading this webpage article (though I hope you won't). But if you're still not sure what this "slash chord" business is all about, please keep reading. 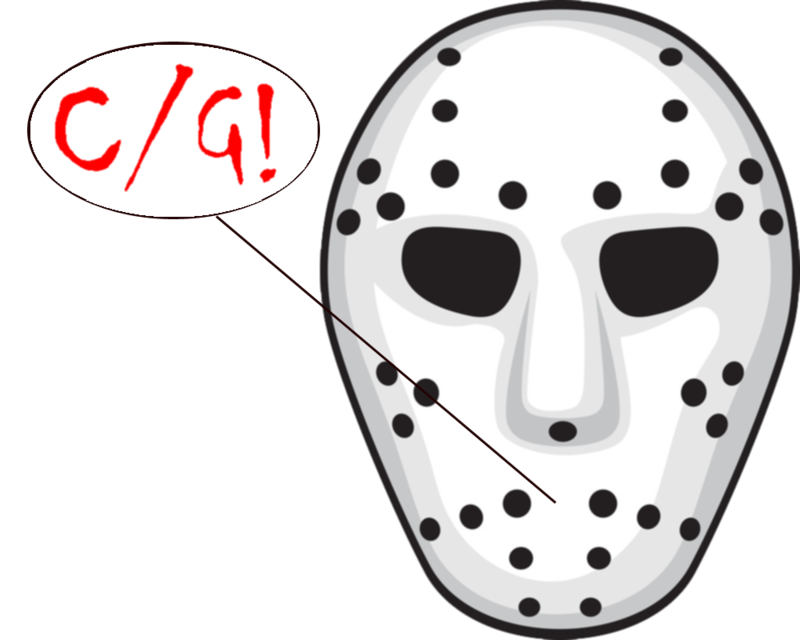 To dispel the fear that a slash-chording horror film icon creates in us, let's start with a common non-slash chord - C - and learn what the symbol tells us. This chord symbol (C) is how we represent a c major chord. Here's how it looks in staff, chord diagram, and tablature notation. The notes of a chord are called "members". The members of a c major chord are the notes c, e, and g.
Next let's look at the same chord, but with a different note in the bass. (The bass note is the lowest note.) We're going to place the note "g" in the bass. We call this chord "C/G". We would pronounce the name of this chord "C slash G". Hey, folks, a slash chord has entered the building! Quick, hide! 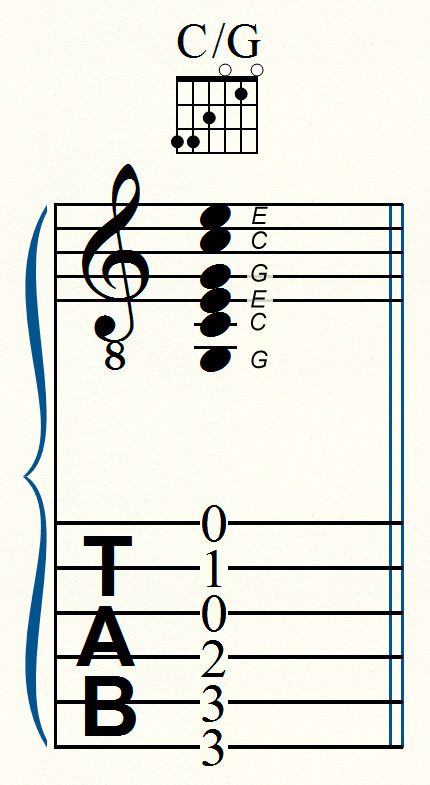 ;-) Here's what this chord looks like in staff, chord diagram, and tablature notation. In summary, a slash chord is a chord symbol that designates a specific bass note. For example, the chord symbol "C/G" would mean to play a c chord with the note "g" in the bass. The part to the left of the slash is the chord. The part to the right of the slash is the bass note. A chord with its root in the bass is referred to as being in "root position", while a chord whose bass note is not the root, but a different chord member, is said to be "inverted". A slash chord can be used to symbolize either one. For example, "C/C" would stipulate that a c major chord be played with the note "c" in the bass - root position - while "C/G" would represent an inversion. Are you still afraid of slash chords? I hope not. If the thought of playing a slash chord still puts fear in your heart, break out your guitar or sit down at a piano and confront it. I promise that Jason will not jump out of the closet with a bloody knife. In fact, I bet he'll bring his bassoon and join you in a rendition of the sound track from Friday the 13th!